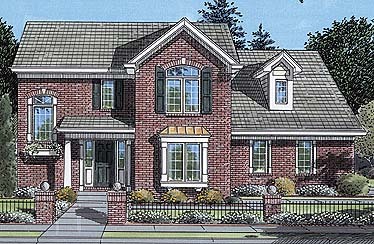 Tall arched windows set into a brick exterior give this home class and style. The covered porch opens into a foyer, which leads straight into the great-room, up or down stairs, or to a hallway heading to the kitchen and utility areas. 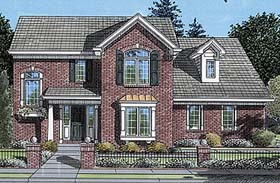 On the second floor, the master suite features a luxurious bathroom, while the three secondary bedrooms share a full hall bath with double vanity. This home is designed with a basement foundation.